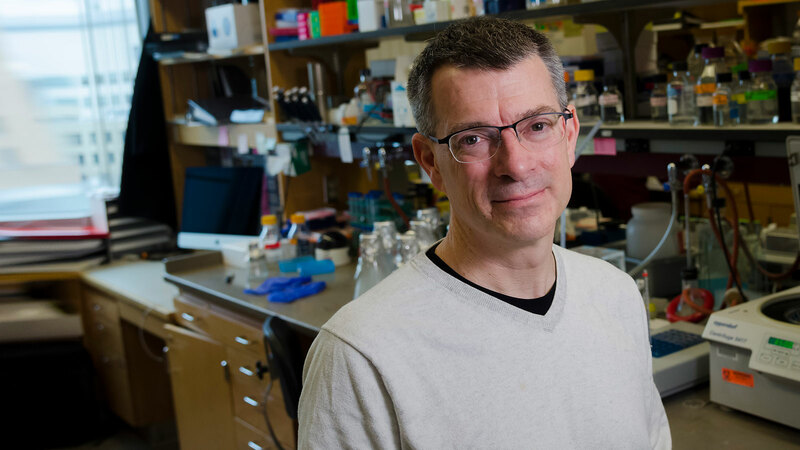 Stephen Bell probes the cellular machinery that replicates and maintains animal cell chromosomes. We focus on the events that occur at the starting points of chromosome duplication. These DNA sequences — called “origins of replication” — are found at multiple sites on each eukaryotic chromosome and direct the assembly of replisomes, which replicate the DNA on both sides of the origin. We study this assembly process to understand how chromosomes are replicated, and how these events are regulated during the cell cycle to ensure genome maintenance. Mechanism and timing of Mcm2-7 ring closure during DNA replication origin licensing. Ticau, S, Friedman, LJ, Champasa, K, Corrêa, IR Jr, Gelles, J, Bell, SP. 2017. Nat. Struct. Mol. Biol. 24, 309-315. Single-molecule studies of origin licensing reveal mechanisms ensuring bidirectional helicase loading. Ticau, S, Friedman, LJ, Ivica, NA, Gelles, J, Bell, SP. 2015. Cell 161, 513-525. Eukaryotic origin-dependent DNA replication in vitro reveals sequential action of DDK and S-CDK kinases. Heller, RC, Kang, S, Lam, WM, Chen, S, Chan, CS, Bell, SP. 2011. Cell 146, 80-91. Initiation-specific alleles of the Cdc45 helicase-activating protein. Rios-Morales, RY, Chan, SH, Bell, SP. 2019. PLoS ONE 14, e0214426. Transcriptional repression of CDC6 and SLD2 during meiosis is associated with production of short heterogeneous RNA isoforms. Phizicky, DV, Bell, SP. 2018. Chromosoma 127, 515-527. Multiple kinases inhibit origin licensing and helicase activation to ensure reductive cell division during meiosis. Phizicky, DV, Berchowitz, LE, Bell, SP. 2018. Elife 7, . Replication origin-flanking roadblocks reveal origin-licensing dynamics and altered sequence dependence. Warner, MD, Azmi, IF, Kang, S, Zhao, Y, Bell, SP. 2017. J. Biol. Chem. 292, 21417-21430. Nucleosomes influence multiple steps during replication initiation. Azmi, IF, Watanabe, S, Maloney, MF, Kang, S, Belsky, JA, MacAlpine, DM, Peterson, CL, Bell, SP. 2017. Elife 6, . Mcm10 regulates DNA replication elongation by stimulating the CMG replicative helicase. Lõoke, M, Maloney, MF, Bell, SP. 2017. Genes Dev. 31, 291-305. Rethinking origin licensing. Bell, SP. 2017. Elife 6, . Chromosome Duplication in Saccharomyces cerevisiae. Bell, SP, Labib, K. 2016. Genetics 203, 1027-67. The dynamics of eukaryotic replication initiation: origin specificity, licensing, and firing at the single-molecule level. Duzdevich, D, Warner, MD, Ticau, S, Ivica, NA, Bell, SP, Greene, EC. 2015. Mol. Cell 58, 483-94.